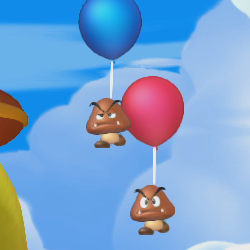 The Goombas attached to floating balloons appear in New Super Mario Bros. U. They are basic enemies attached to balloons, acting similarly to the Para-Goombas of Super Mario World except floating from the opposite direction. Balloon Goombas' only appearance is in the Sparkling Waters stage Skyward Stalk. They float straight upwards from the bottom of the screen on a balloon. When its balloon pops, it will begin walking like a normal Goomba. Mario can jump off the balloons for extra height. There are only six balloon Goombas in the game. ↑ Stratton, Steve. New Super Mario Bros. U PRIMA Official Game Guide, page 95. This page was last edited on April 5, 2019, at 15:36.